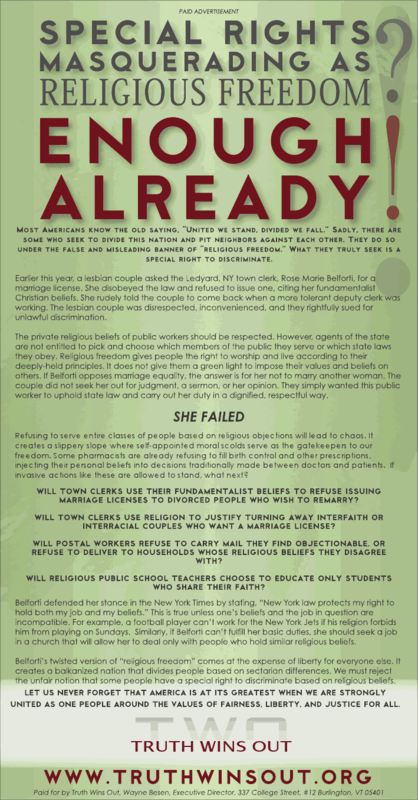 Burlington, Vt. – Truth Wins Out announced today that it would place a groundbreaking full-page ad (see below) in the Ithaca Journal on Saturday that debunks the Religious Right’s latest strategy of claiming they are victims of religious discrimination when asked to follow the same laws as other citizens. TWO’s hard-hitting ad is headlined “Special Rights Masquerading as Religious Freedom” and signals that this fraudulent argument, increasingly used by anti-gay activists, will be vigorously challenged and exposed as a lie. TWO’s ad is in response to the unethical actions of Ledyard, NY town clerk Rose Marie Belforti, who refused to issue a marriage license to a lesbian couple. Belforti disobeyed the law and then justified refusing to do her job by claiming she was a victim of religious discrimination. Until recently, anti-gay activists argued that LGBT people were not entitled to equality because it was contrary to the will of the people. As recent polls show a sea change in support for marriage equality, particularly among younger demographics, the extreme right has switched its strategy. They now try to pose as martyrs whose beliefs give them the special right to discriminate and ignore the law. Will town clerks use their fundamentalist beliefs to refuse issuing marriage licenses to divorced people who wish to remarry? Will town clerks use religion to justify turning away interfaith or interracial couples who want a marriage license? Will postal workers refuse to carry mail they find objectionable, or refuse to deliver to households whose religious beliefs they disagree with? 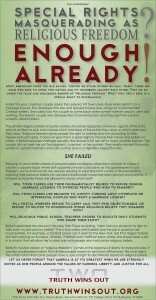 Will religious public school teachers choose to educate only students who share their faith? This latest effort is part of TWO’s Center Against Radical Extremism (TWOCARE), which debunks right wing propaganda and misinformation campaigns. TWOCARE also monitors and reports on extremist organizations and launches campaigns to spotlight their dangerous views.